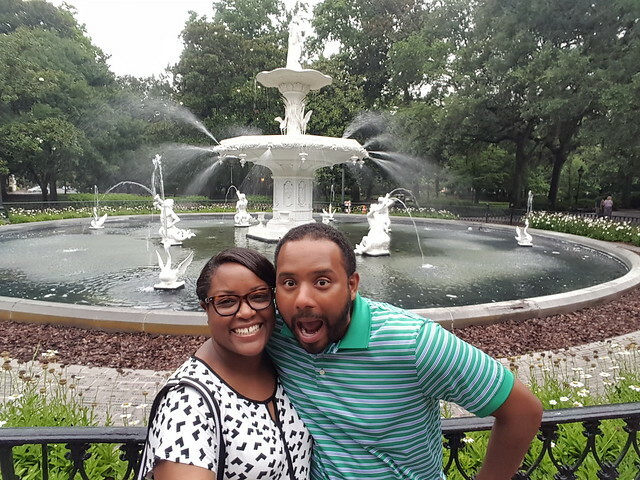 My husband had a birthday on Monday so we decided to take a trip to Savannah, GA on Friday. I’ve traveled a lot in the US and he has traveled a lot internationally but somehow Savannah is a city neither one of us has even been to before. It wasn’t too far of a drive (a little over 8 hours), so we decided to give it a go. We also bought a selfie stick as you can tell in the picture above. I also have the new Samsung S6 Edge and the front facing camera is ah-mazing! This photo was pre-selfie stick and proves why we needed to make that critical purchase (LOL). 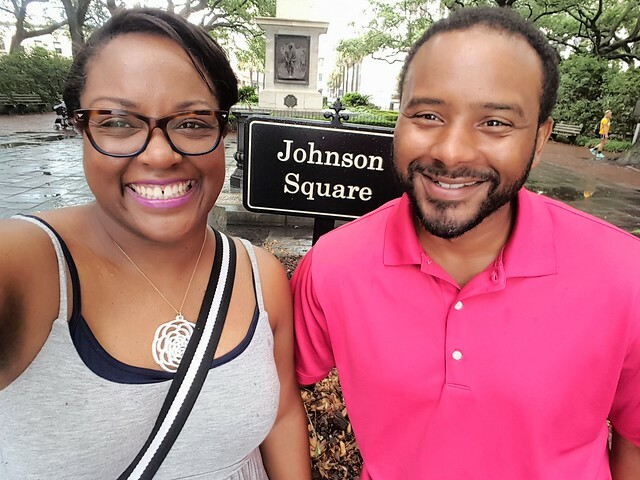 We found Johnson Square, the best square in Savannah since that is our last name. We took a trolley tour to see the city, hopping on and off to explore a bit. We also ate a lot of grits. I cannot tell you how delicious the Black and Bleu Grits are at The Funky Brunch Cafe. We also stayed at the Mansion at Forsyth Park which was delightful in so many ways. Needless to say, Savannah, we will return. Typically whenever I travel, or just whenever, I have a knitting project with me. I was not successful in finishing the Togue Pond tank before I left, but I finished the body the night before we left. We had a little down time after a big rainstorm and I decided I had enough time to sit in a luxuriously big armchair in our hotel room and finish the main part of the tank. 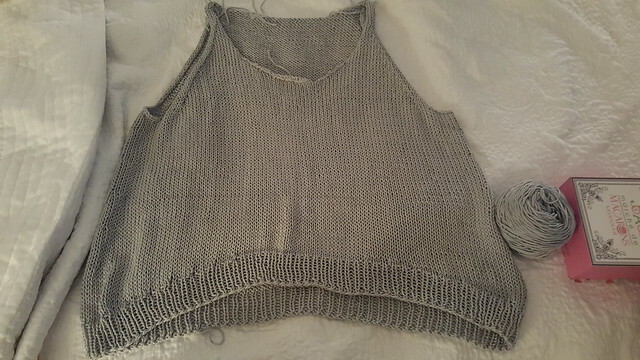 I used the car ride home in the morning to complete the ribbing around the neck and underarms and then soaked and blocked it when we got home. I’ll do a more in depth post with pictures and my thoughts on it but I can definitely see myself knitting up one more of these for myself. It was pretty quick and I’m still obsessed with the yarn for summer. So that’s what’s been happening with me, what’s new with you? Next Post It’s A Celebration! I have always wanted to go to Savannah…Someday…Glad the trip was a success. It was so delightful! It was such a nice weekend getaway. I highly recommend. Good job on getting some knit time in with all that fun you guys were having. Will put Savannah on my US travel list.